The Toshiba Vision screen in Times Square is showing pictures taken of and by the Hubble Space Telescope every few minutes through April 26. In this image, the lower screen shows V838 Monocerotis. 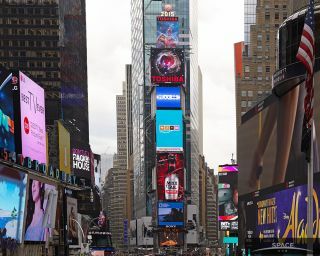 Advertisements hawking clothing, smart phones and theater tickets usually overwhelm New York City's Times Square — but look closely this week and you'll also see exploding stars, whirling galaxies and bubbling nebulas. In celebration of the 25th anniversary of the launch of the Hubble Space Telescope, The Toshiba Vision screen in Times Square is displaying awe-inspiring images taken by Hubble, as well as a few snapshots of the telescope itself. The pictures appear every four to five minutes on the two massive screens that rest just beneath the famous New Year's Eve ball. This isn't the first time the Toshiba screens have broadcast amazing images from space. An image of the Horsehead Nebula, taken by the Hubble Space Telescope appears on the lower of two screens in Times Square shoing Hubble-related images through April 26. On the top screen, a shot featuring the telescope. Among the featured photographs is one of the Horsehead Nebula: a puffy gas cloud that appears to curl in on itself like an ocean wave. The horse-like feature is actually part of a larger nebula that lies 1,500 light years from the sun in the Orion constellation. Another image shows the bright red heart of V838 Monocerotis, a once-dull star that suddenly became 600,000 times more luminous than the sun. The rapid brightening, which took place in January 2002, is what astronomers call a "light echo," in which the light from a stellar explosion reflects off a cloud of dust surrounding it. An image of two interacting galaxies known as Arp 273, captured by the Hubble Space Telescope, floats above the earth-bound hustle and bustle of Times Square. In August 2012, the Toshiba Vision screen also broadcast the Mars rover Curiosity's touchdown on the Red Planet. The company then continued to broadcast images from the rover through October of that year. On January 1, 2014, the same screen showed astronauts aboard the International Space Station delivering a New Year's greeting. Hubble was launched in 1990, and was the first optical telescope to operate above Earth's atmosphere, which blurs optical light to such a degree that ground-based optical astronomy was severely limited. Five crewed repair missions have kept Hubble going for 25 years, and NASA does not have a set date for when Hubble will stop operating. Hubble could have many more years of discoveries ahead of it.